The REACH regulation confronts companies in its area of validity with substantial expenditure regarding the compilation, management, content updating and dispatch of safety data sheets (SDS). From the aspect of costs, this involves considerable consequences, which are reflected initially in the balance sheet and right up to the annual report. As EU legislation already states the minimum aspects to be complied with, there is potential for optimisation only in the field of individual implementation. In the course of the digital transformation, from which all companies that open up new pathways will emerge stronger, new opportunities are constantly presenting themselves for companies to obtain a boost to their competitiveness in the field of electronic media and cloud-based automation. Digital, self-regulating business processes resorting to event-triggered work flows and Internet-based mechanisms represent the feasible status quo of our age, against which all companies must allow themselves to be measured – in particular with corresponding targets from the competition. Safety data sheets give professional users all the important safety-related information about materials and mixtures in the supply chain. Its purpose is to warn and protect against possible health risks. A SDS must always be provided by every supplier of dangerous goods. The latter is responsible for ensuring that the SDS is factually accurate and complete. Regular updating to the latest status is compulsory. The SDS is the most important communication tool in product safety along the supply chain. It is intended to inform users in a clear and easily legible manner about the most important safety aspects and any risks to human health and the environment when handling the relevant products. The EU “REACH” chemicals legislation has brought a series of formal and content changes for compiling the SDS. The most important new content concerns the fact that companies must describe the use of the materials affected by REACH and derive risk assessments from the latter. In Chapter 1 of the SDS it now applies that all uses of a substance must be shown in the form of an overview. In addition, the SDS will have an appendix for every use, which itemises all the parameters relevant for the consideration of risks. means no constant maintenance expenditure. 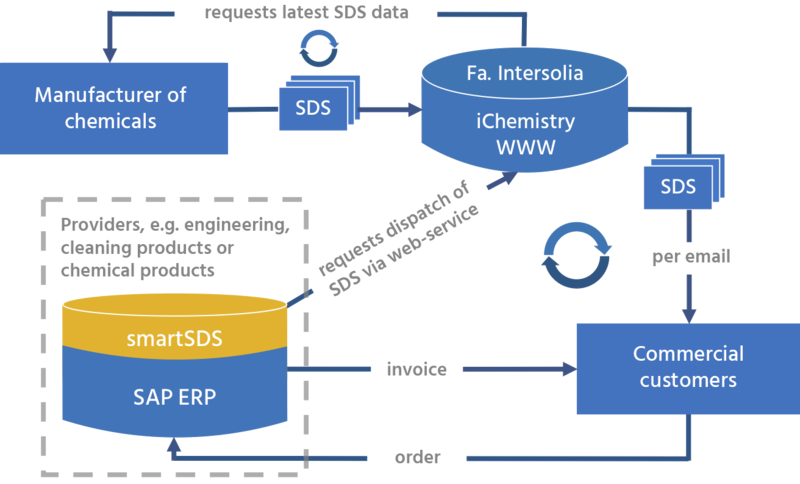 The product iChemistry from the company Intersolia is a pre-condition for smartSDS. We will link your SAP-ERP system via web services that are exclusively outbound (or inside-out) with a cloud-based Internet application, containing all the safety data sheets required for your range. Our solution is fully integrated with your logistics processes running in SAP so that – even before the delivery has left your company – your customer will be provided with all the necessary SDB electronically by email. Please contact us at any time for further information or a personal appointment! SAP-compliant and release-proof solution using established and stable standard technologies. No more personnel commitment through MSDS administration or physical handling in shipping. Always up-to-date and legally compliant MSDS. Fully automated and digital MSDS shipping process 24/7. Targeted MSDS dispatch to dedicated contact persons at your customers. Complete documentation of the shipping process.